IWINETC 2014 winds up with a visit to Tbilisi. Madloba Georgia! IWINETC 2014 officially came to a close on 2 April 2014 after eight busy days of business, insights, touring, networking and a buzzing 2 day conference & exhibition. With many delegates back in Tbilisi it was appropriate to tour Georgia’s capital and discover some of it’s highlights. The Bodbe Monastery is a large Georgian Orthodox complex located about five minutes from the historic town of Sighnaghi. The many features of the complex include a Russian built tower and perhaps more importantly a monastery with the coffin of St. Nino. St. Nino is noted for bringing Christianity to the forefront in the 4th century. She spent much time living at Bodbe and requested that her remains be buried in Bodbe. 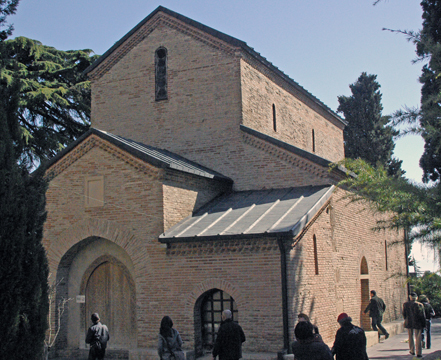 At one point, King Mirian wanted to honor St. Nino by moving her coffin to the Cathedral of Svetitskhoveli at Mtskheta. Two hundred people tried to lift the coffin from its location and failed to do so. Then King Mirian declared that St. Nino’s coffin should remain at Bodbe and had the church built at Bodbe. Bodbe complex also has St. Nino’s Spring, where healings have occurred. To reach the spring, it is a long walk up and down a series of steps. For those with the time and energy, this may be a wonderful opportunity. A small church has been erected in honor of St. Nino’s parents at the spring. Today the Bodbe Monastery complex is home to a number of nuns who are dedicated to preserving the site. While we were visiting we saw a large building under construction. This will be the new monastery. In addition massive and well cared for terrace gardens are visible. A visit to the Georgian National Museum (GNM) was an important conclusion of the study & research tour of IWINETC. In terms of the development of wine tourism in Georgia the museums and galleries are an integral strategic part of the overall stories about the heritage and culture of wine. It is impossible to speak about Georgia as the cradle of wine without preserved objects and documents in museums and galleries, whether it be national, regional, local or specialized. The special cultural and developmental role and mission is assigned to Georgian National Museum, established at the end of 2004 for preserving, researching and communicating the nation’s rich, authentic content of cultural heritage provides learning experiences for everyone. It supports the care and management of the nation’s collections, both material and intangible (living) heritage, to expand and sustain access for current and future generations. The GNM unifies five museums in Tbilisi (Museum of Georgia, Museum of Soviet Occupation, Museum of fine Arts, Open air museum, Tbilisi history museum) and many others museums in regions of Georgia. 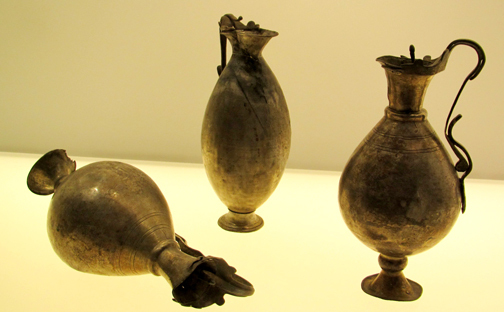 On the museum tour we can get to know the oldest preserved archaeological objects, bearing witness to several thousand years of culture of wine in Georgia. One of the developmental priorities of the cultural and tourism policy should be the creation of a specialized, interactive and responsible museum about the culture of wine in Georgia. The last day of the International Wine Tourism Conference 2014 has been quieter than usual, with more than half of the delegates gone on their homebound flights to different parts of the world. The last ones who remained for another day returned to Tbilisi and were able to see more of the capital with a walking tour of the 5th-century Old Town. The buildings were eclectic, having Byzantine, European/Russian and Middle Eastern architectural influences. The walk ended at the Caravanserai of Tbilisi. A Caravanserai is a big uninhabited building built for trading and shelter for travelers. Merchants and travelers met there for trade and exchange of goods thus these activities were important to the flow of commerce and information in the city. The caravanserai in Tbilisi has the typical rectangular walled exterior and outfitted with identical chambers to accommodate the merchants, animals and servants. 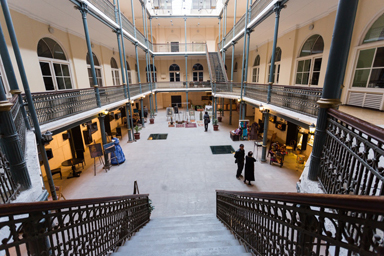 The first floor housed stalls and workshops while the second floor was used for trading Asian and European goods. The 17th century big caravanserai that was built by King Rostom faces Sioni Street. This was then given to the Bishop of Tbilisi as a present. It had undergone an extreme refurbishing in 1912. 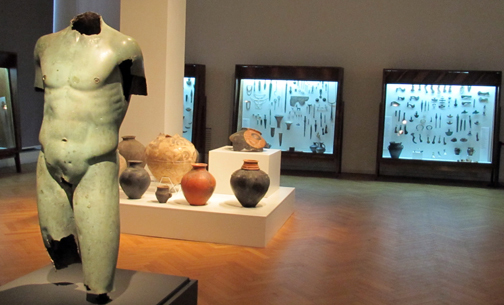 It houses exhibits that reflect the history of Tbilisi from the end of the 4th millennium to the present date. On the ground floor, you can indulge in shops selling different kinds of local artisanal products from talented artists.